A New Map of Spain and Portugal Divided into their respective Kingdoms and provinces from the Latest Authorities. An extremely attractive example of John Cary's 1801 map of Spain and Portugal. Consists of the entire region of Iberia including the islands of Minorca, Majorca and Ibiza, parts of northern Africa, and Parts of France. Highly detailed with color coding according to region. 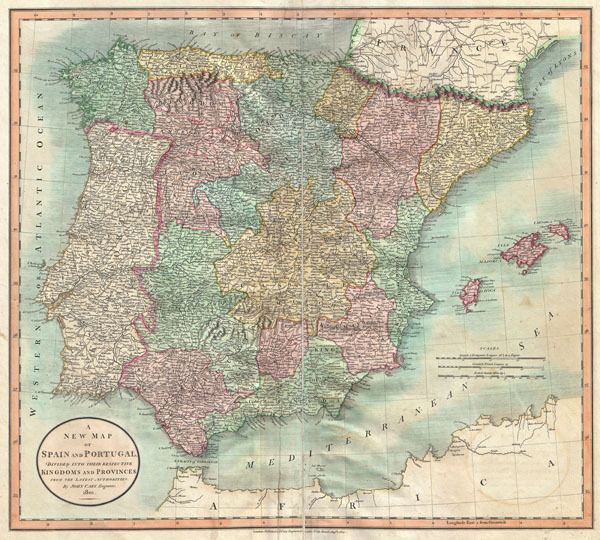 All in all, one of the most interesting and attractive atlas maps Iberia to appear in first years of the 19th century. Prepared in 1801 by John Cary for issue in his magnificent 1808 New Universal Atlas. John Cary (1754 - 1835) was a London based cartographer active in the early part of the 19th century. Ronald Vere Tooley, the prominent English map historian, writes of Cary, "As an engraver he was elegant and exact with fine clear lettering and great delicacy of touch." Cary began his work as an engraver, cartographer, and globe maker in 1776 with his New and Correct English Atlas. This important atlas represented a new phase in cartography where accuracy and detail rose in prominence over the decorative embellishments of the 18th century. This change was indicative of the times when travel and commerce were expanding globally as never before. Cary's mastery of both engraving and cartography resulted in a series of seminal works that redefined mapmaking in the early 19th century. His stupendous Cary's New Universal Atlas, published in 1808, set the standard for all cartographers who followed. Cary reissued this seminal atlas in 1811, 1819, 1824, 1828, 1833, 1836 and 1844. Cary also did considerable work on the English Ordinance Survey prior to 1805. His cartographic work particularly inspired the Edinburgh school of cartography as represented by John Pinkerton and John Thomson. In America, Cary's work was used as the basis for Tanner's important New American Atlas. Cary's last published atlas appeared posthumously in 1844, however, by 1850 Cary's work was being carried on by his sons and other well-known cartographers including James Wyld, John Tallis & Company, and Crutchley. Cary, John, Cary's New Universal Atlas, containing distinct maps of all the principal states and kingdoms throughout the World. From the latest and best authorities extant. London: Printed for J. Cary, Engraver and Map-seller, No. 181, near Norfolk Street, Strand, 1808. Good condition. Old verso repair of centerfold split. Some light offsetting, minor soiling and buckling. Rumsey 1657.020. Phillips (Atlases) 714. The Map Collector, issue 43, p. 40-47 (Atlas). National Maritime Museum, v. 3, no. 311.